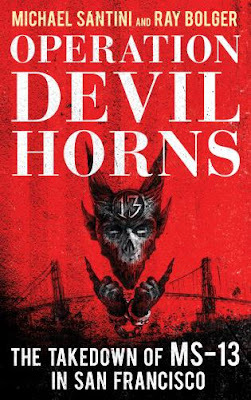 The Washington Times published my review of Operation Devil Horns: The Takedown of MS-13 in San Francisco. “Operation Devil Horns: The Takedown of MS-13 in San Francisco” is a true crime story about one of the most brutal and ruthless transnational gangs in America and the dogged special agents, federal prosecutors and local police officers who took down more than two dozen MS-13 gang members in the City by the Bay. Written by Homeland Security Investigations (HSI) Special Agent Michael Santini (a pen name) and veteran journalist Ray Bolger, the book offers not only a story of a four-year (2004-08) law enforcement operation against the MS-13 20th Street Clique in San Francisco, it also offers a glimpse into the MS-13 subculture. Through surveillance and information provided by two MS-13 members that Special Agent Santini convinced to become HSI informants, HSI discovered how gang members lived and interacted with wives, girlfriends, children and fellow gang members. More importantly, they learned about MS-13’s criminal gang activities, which included drug and gun dealing and murder. Founded in 2003, HSI is the investigative arm of U.S. Immigration and Customs Enforcement (ICE) and the Department of Homeland Security. HSI investigates cross-border criminal activity, such as money laundering, human smuggling and trafficking, cybercrimes, commercial fraud, narcotics and weapons trafficking, and transnational gang activity. Aided by the San Francisco Police Department and other federal law enforcement agencies, HSI Special Agent Santini spearheaded the investigation of MS-13 and the eventual arrest of gang leaders and members for committing a number of federal crimes, including conspiracy to commit murder in aid of racketeering.